The busiest Virginia airport is the Dulles International Airport. Other major Virginia airports include the Charlottesville-Albemarle Airport, the Lynchburg Regional Airport, the Newport News/Williamsburg International Airport, the Norfolk International Airport, the Richmond International Airport, and the Roanoke Regional Airport. 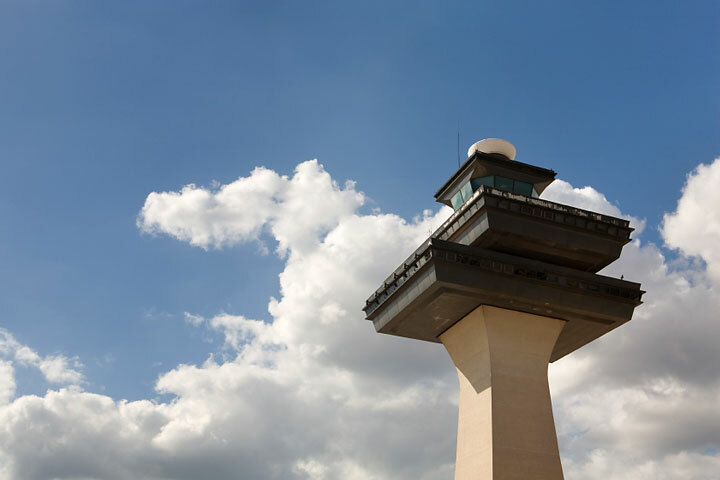 The photo at right shows the control tower at Washington-Dulles International Airport. This Virginia airport map shows FAA-designated commercial service airports, reliever airports, and general aviation airports in the Commonwealth of Virginia. Primary airports are designated with an airplane symbol. Virginia airport map source: FAA 2001-2005 NPIAS.